Point A: Home. Point B: Childcare. Point C: Work. The point: we’re crazy! I live 3 miles from my office, but my commute is about 14 miles round-trip. Say what? You see, back when we were seeking childcare for little A, I had a ridiculous dream. What if, instead of a big institutional day care like we were considering, we could find a nanny-share with someone who spoke German? We didn’t think we could actually afford a nanny-share, much less with someone from the global north, but I decided to put it out there and see if the universe would prove me wrong. And…the universe delivered. From 13 weeks, little A has been with an amazing caregiver and her daughter, resulting in her first words being “Baum” (tree) and “wow wow” (the German version of bow wow). Perhaps because her mama is more talkative than her papa, she does speak more English than German these days, but she understands both and she is totally attached to her second family. But her second family lives about 4 miles in the wrong direction from work, and we don’t have a car. For about a year, amazing caregiver came to our house in the morning and evening to collect and drop off little A (did I mention she’s amazing?) but her long-term plan was to start an in-home German language day care. So last summer, Peter started biking north in the afternoons for the pick-up, and by fall I was taking the morning shift. 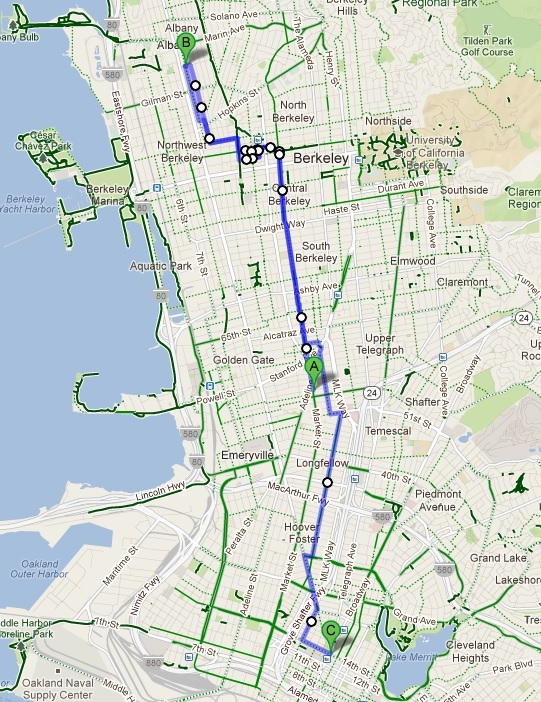 So now I have a 90 minute bike commute each morning – 8 miles round-trip to day care, then 3 to work. In the afternoon, it’s just the 3 miles home. On days when I swim, I add another 3 miles round-trip to and from the pool…and days like today where I biked to a meeting, I can add another couple of miles. Phew! The downside, of course, is that we spend a lot of time biking with A instead of playing with A, and had I been thinking more strategically, we would never have started down this path. People without cars should not look at childcare options farther than a mile away, unless they’re on the way to work. But I cut myself some slack given that I was making these decisions while under the influence of a 10-week-old who didn’t much seem to like sleeping. But we totally love our caregiver. And so does little A. When we go away, she asks for the whole family by name. That in itself is totally worth it.